Lion fans show off their pride at pregame tailgating. Organizations and families gathered in Friendship Circle. Among the tailgating activities, another thing likely to be witnessed is university fans urinating by the side of the Pottle Music Building. 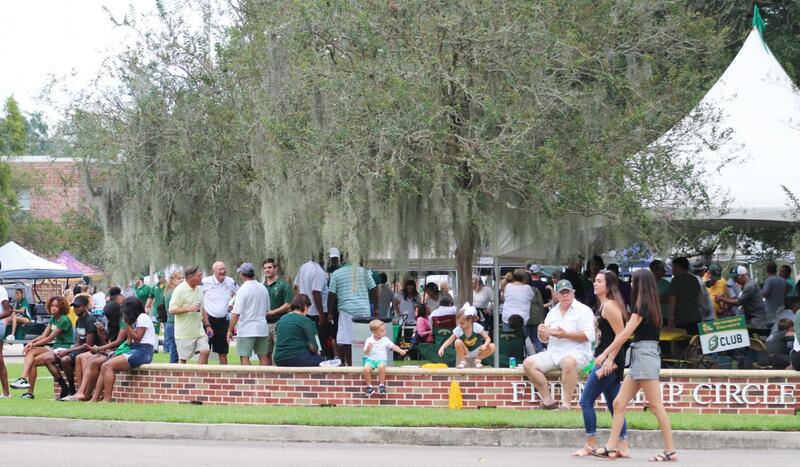 Before any home football game at Strawberry Stadium, university sports fans fill Friendship Circle wearing their green and gold. The smell of charcoal grills and music fills the environment. Different departments and organizations on campus pack the circle with tents, beer and varieties of pregame activities. Some try to take their best pictures in university colors. The bathroom inside Pottle is open to the public during tailgating. To use the bathroom inside Strawberry Stadium, however, tickets need to be used and then purchased again if the person leaves the stadium. Some fans use the side of the building for convenience because they do not feel like walking to the stadium. Jacob Caraway, a Lions fan, shared his reason for participating in this behavior. “I use it because I don’t feel like walking all the way to the stadium and spending my ticket to use the bathroom,” said Caraway. According to Caraway, he uses the ground by Pottle out of necessity and convenience in his years attending games rather than hate or spite. “Sometimes I have to use the Pottle building because it is discrete and close to our family tent,” said Caraway. I can’t believe this is happening. This behavior is absurd, rude and completely unacceptable! Campus Security needs to monitor this. Arrests need to be made. I am from the class of 1975. This would never have happened back then! Wow what disrespect!!! Too lazy to used the restroom???? These people need to be arrested. How unsanitary and disgusting. What on earth is happening here folks?? Do a citizen’s arrest if necessary!! I certainly would not want to walk around that. Just disgusting people who have NO RESPECT FOR OTHERS OR EVEN THEMSELVES. Very very sad to know this is happening on my campus in my town!! Wow. That is disrespectful. It clearly has nothing to do with the policy, but instead has to do with people being lazy to go inside of Pottle where the bathroom is open.